(Nanowerk News) Scientists from the Tomsk Polytechnic University's Laboratory of Novel Dosage are developing a technology to control mesenchymal stem cells of patients (Advanced Healthcare Materials, "Mesenchymal Stem Cell Magnetization: Magnetic Multilayer Microcapsule Uptake, Toxicity, Impact on Functional Properties, and Perspectives for Magnetic Delivery"). The technology will allow treating cancer more effective. To fight cancer cells the scientists suggest using the patient's own magnet controlled cells. Native body cells won't be rejected by its immune system and can deliver medication directly into the center of the disease. The development of magnetic cells is jointly carried out by Tomsk Polytechnic University (TPU) and colleagues from Pavlov State Medical University of St. Petersburg and Queen Mary University of London. The novel technology implies that mesenchymal stem cells (MSCs) of the patient's body with the size of about 10 microns are internationalized with magnetic controlled microcapsules with drug inside. 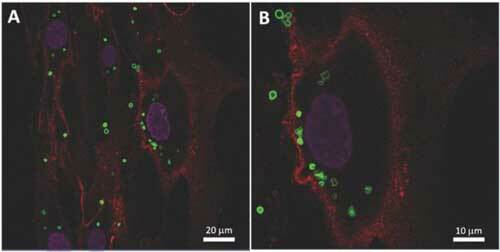 External trigging (magnet) targets cells to tumor; make microcontainers open and release encapsulated compound. Thus, drug is precisely delivered affecting cancer cells and without causing harm to health. "Mesenchymal stem cells are inherently able to migrate toward tumors. They also can differentiate under control into mesodermal cell types of bone, fat, cartilage, muscle or connective tissue in vivo and in vitro. Therefore, MSCs are very attractive for researchers and practical physicians to apply them in substitute therapy, gene or cell engineering," says one of the development's co-authors Alexander Timin, JRF at the Novel Dosage Laboratory, RASA Center at TPU. For the first time, the scientists have demonstrated the efficiency of internationalization of magnetic microcapsules by MSCs to functionalize cells and to design magnetic controlled cells and tissue engineering systems. "It is interesting to note MSCs exhibit a high capability to internationalize (capture) microcapsules without significant toxicity compared to other cell lines described in the literature. As a result of magnetic capsules internalization by MSCs we create a new cell engineering platform which is responsive to external magnetic field to control cell migration. This way magnetization of MSCs enables magnetic sorting of cells and form a cell spheroid out of tens of thousands of MSCs. Also, the obtained results can be further used to create a next generation cell-modified platform for efficient targeted delivery ex vivo," the authors note.